Perfect dual panel file manager for Mac that flawlessly combines an FTP client for Mac and an Amazon S3 browser and provides you with the built-in Mac Terminal emulator making it super easy for you to manage all the system processes. Commander One's interface lets you open an unlimited number of tabs, supports any file types, offers the ability to set up your very own hotkeys for any action, and way more. Set up your own key combos for lightning-fast operations with files. Any action is much faster with your favorite hotkeys. Command Line bar offers great control over your files. Your file structure and system processes are in good hands with the built-in Mac Terminal emulator. 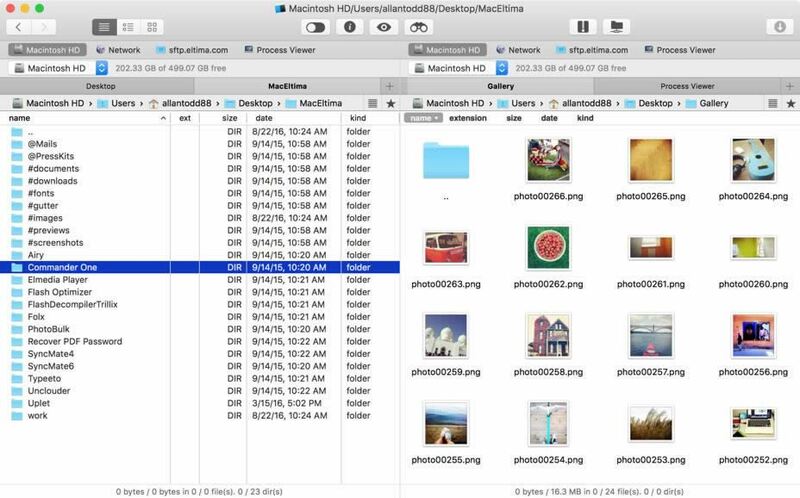 Commander One is probably the fastest way to copy, move, delete the files, and more. With its optimized mechanisms, Commander One helps you save time and disk space. *Your cloud files are not kept on the hard drive. You can save the hard disk space by means of mounting cloud services like Dropbox (2GB), Google Drive (15GB), Microsoft OneDrive (30GB), etc. With built-in FTP manager you can easily connect to remote servers through FTP, SFTP or FTPS. With two panels instead of just one, Commander One promotes efficiency and speed and also neatly organizes your file operations in queue. Plugins with additional functions by third-party developers will be supported by Commander One in the nearest future. Commander One can be personalized up to your individual preferences with its endless color options.